As I draft this post, I am sitting in front of a computer at my work. No, I’m not typically paid to write blog posts while working, but even my boss would understand (in the off chance she happens to read this someday) that today of all days is a perfectly acceptable day to blog while working. Why? Today is the first day that the mercury hit 100 degrees in my little city this year. This means that everyone is at home trying to stay cool by exerting as little energy as possible while cranking up the A/C. What does this mean for business? NO business, that’s what it means. Yep, the place is dead. This is far from typical, and so I find myself needing something to do with my brain while the few remaining minutes of store hours slip by….so….slowly. The brain does strange things when it’s bored. For instance. 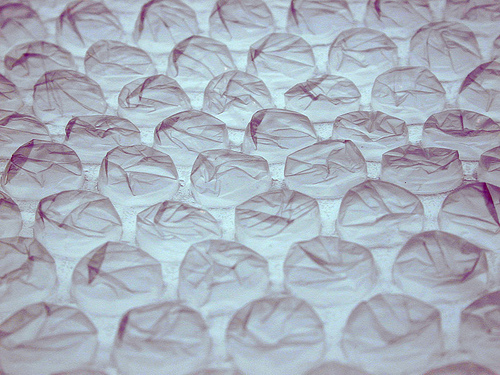 I work at a postal center, which means that the place abounds with packing material for processing shipments of all shapes and sizes, bubble wrap being one of them. Our bubble wrap comes in industrial-sized rolls of 100 feet (I think), which measure over 3 feet tall. (Yes, I know this because I was bored enough to measure it.) One of those rolls happened to be sitting in my line of sight earlier, and what was the first thing thought that came to mind? I wonder if I could balance that on my head. So Kaity, the person who always thinks about the way she’s being perceived by others, finding herself alone in an empty store with a giant roll of bubble wrap, picked the thing up and put it on her head. Without even thinking about it twice! I’m so hopeless. The funny thing was that as soon as I had done it, I realized how silly it looked and couldn’t help but laugh. And that’s good I think, being able to laugh at yourself. Living too seriously is no fun. This entry was posted in Uncategorized and tagged bored, bubble, hot, mail, self conscious, work, wrap by Kaity. Bookmark the permalink.